Many homeowners are dreaming of a new makeover for their kitchens and we’re here to tell you its closer than you think. Whether you’ve inherited a worn out kitchen from previous owners or family life has simply made your lino look tired and your wooden worktop ashy, replacing key elements can give you a stylish, modern kitchen without the cost and hassle of completely gutting the place. Our list below will help you choose the right level of kitchen refurbishment for your home and renew your kitchen. Thanks to engineering advances, marble and granite worktops are much more affordable today than ever before and we have a variety of options depending on your budget. While previous generations looked to short-lived or more fragile materials, such as vinyl, wood or tile, for their kitchen worktops, today you can choose from a wide range of natural and engineered stones as well. If you’re happy with your cabinets, replacing a tired kitchen worktop with a modern stone countertop can give your kitchen an immediate boost. 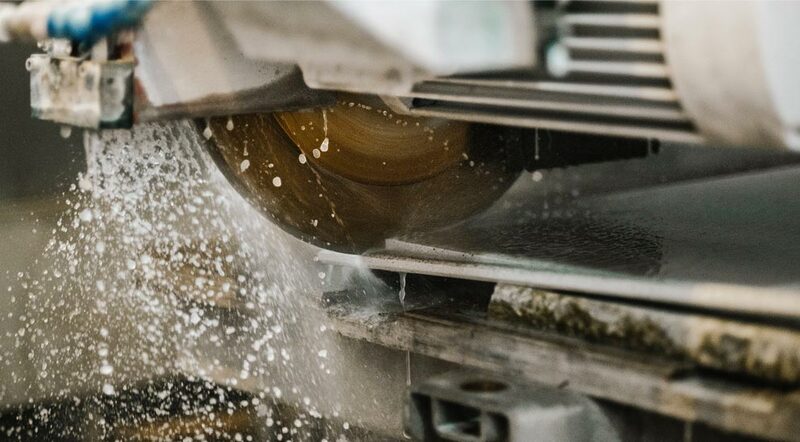 Our expert stone workers will create an exact template of your kitchen, and use it to hand craft your worktop to match your exact specifications. If you’re happy with the layout of your kitchen and your cabinets are in good condition, replacing your kitchen worktop and cabinet doors will give your kitchen an updated, modern look while limiting the cost. 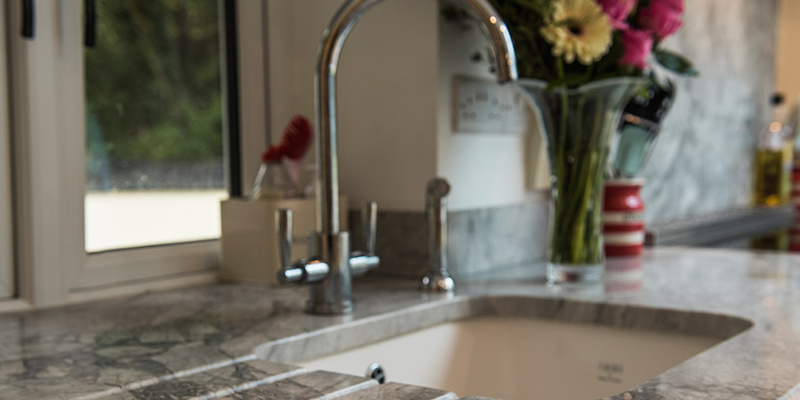 We have a variety of options for kitchens from original to more contemporary worktops, we have selection of custom stone worktops such marble, quartz, granite and many more. Cabinet doors are typically mass manufactured and sold in standard sizes. However, at Surrey Marble and Granite we make each of our kitchen worktops by hand, to match an exact template made in your kitchen. This means that not only will you get the perfect fit, you can also choose from any stone in our catalogue without worrying if it comes in the right size. 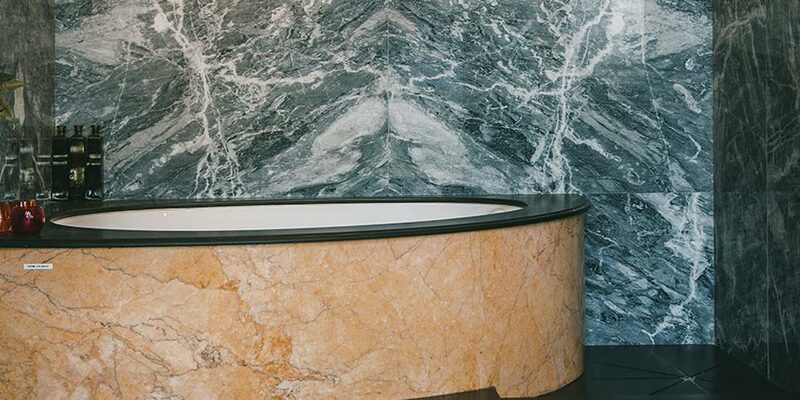 Even hard-as-rock granite can start to look dowdy if it’s not been cared for and more delicate stones like marble and limestone can suffer from a build up of limescale, staining and other issues. We will assess you worktop and look at the highlighted errors in the surface, we will then explain how we will reface and recreate you worktop to its former glory. Fortunately, refurbishing and refinishing a stone worktop is a simple job that can often be done in situ. Depending on the level and type of damage, the refurbishment may involve stripping and refinishing the stone; removing a few millimetres of the surface to rejuvenate damaged material; patching, filling or other repair work; or even remodelling and recutting the stone to fit a larger sink or alter damaged edges. We strongly recommend sealing natural stone as this will reduce staining and damage in the future, make sure you respray and worktops. Turning a drab cooking space into your dream kitchen might mean knocking a wall down or completely changing the layout of the cupboards and countertops. At Surrey Marble and Granite our fitters are accustomed to working with other traders and builders so we can fit in with their schedules to make sure your kitchen renovation is completed in a timely manner. We won’t compromise on quality, however, so we’ll make sure we’ve got a millimetre precise template to work from and a clear understanding of the space your new stone worktop will occupy. 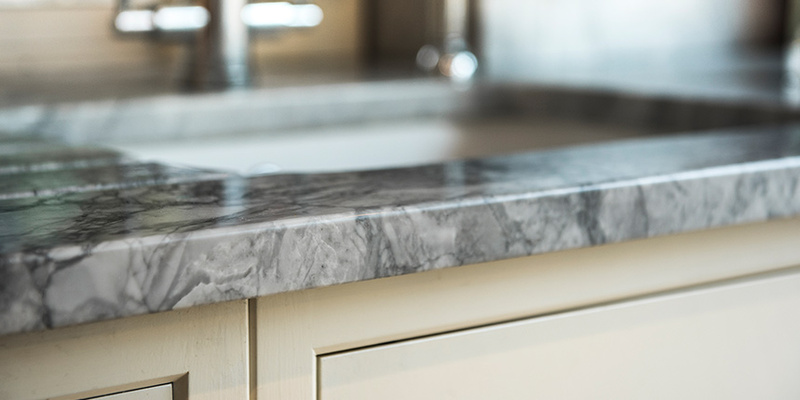 At Surrey Marble and Granite we are able to carry out all aspects of the refurbishment project including carpentry, decorating, construction, installation, plumbing and electrical. Our renovations are all carried out by our certificated and qualified SMG representatives. We have a variety of stones available for your ideal kitchen worktop such as Granite, Marble, Quartz and many more available. If you have any questions please ask a member of staff and get in touch if you would like a free quote today.